BridgePsychSoc is a student-led interdisciplinary conference for postgrad students funded by the ESRC DTC. This conference aims to bring together researchers from across the social sciences who contribute to the understanding of human psychology. 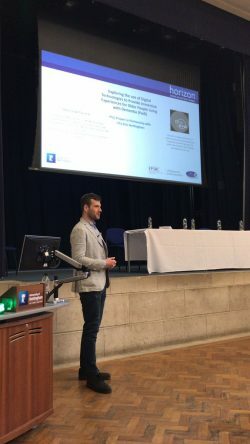 The BridgePsychSoc conference was held on 12th April 2019 at the University of Nottingham and included research talks by postgraduates, student-led discussions, and an academic panel session. One of the research sessions concentrated on the intersections between the social and the psychological. During this session, Stanislaw Piasecki (cohort 2018) gave a talk on exploring the use of digital technologies to provide immersive experiences for older people living with dementia. More info about the conference can be found here .